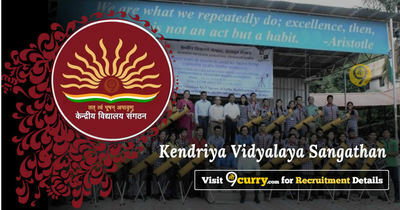 KVS Recruitment 2019 - Below are various recruitment notifications published by Kendriya Vidyalaya Sangathan / kvsangathan.nic.in. As of now, we don't have any active recruitment notification by KVS featured here. We may update as soon as the organization announces a new job notification. If you are looking for any information related to previously organized recruitment drives by KVS, you can browse through previous job notifications mentioned below and get the new updates or information you are looking for. KV BSF Krishnanagar Recruitment 2019 - Walk in for TGT & PRT Posts in KV BSF Krishnanagar, West Bengal on Contract Basis. Candidates are invited by Kendriya Vidyalaya BSF Krishnanagar, West Bengal to attend walk-in-interview to be held on 20 Feb 2019 07:30 AM. KVS Recruitment 2018 - Apply Online for 8339 PGT, TGT, Primary Teacher & Other Posts in KVS, Across India on Direct Recruitment. Online Applications are invited by Kendriya Vidyalaya Sangathan from 24 Aug 2018 to 13 Sep 2018 till 11:59 PM for 8339 vacancies. KVS Recruitment 2018 - Apply Online for 36 Finance Officer & Section Officer Posts through Limited Departmental Examination (LOE-NT) 2018 in KVS. Online Applications are invited by Kendriya Vidyalaya Sangathan from 18 Apr 2018 to 02 May 2018 for 36 vacancies. KVS Recruitment 2018 - Apply Online for 5193 PGT, TGT, Head Master & Vice Principal Posts through Limited Departmental Competitive Examination (LDCE) 2018 in KVS, New Delhi. Online Applications are invited by Kendriya Vidyalaya Sangathan from 11 Apr 2018 to 25 Apr 2018 (Extended til 01 May 2018) for 5193 vacancies. Kendriya Vidyalaya KVS Class II to IX Online Admission Form 2018 - Apply Online for Admission in KVS Class II to IX Across India. Online Applications are invited by Kendriya Vidyalaya Sangathan from 02 Apr 2018 08:00 AM to 09 Apr 2018 04:00 PM. KVS Nuapada Recruitment 2018 - Walk in for TGT, Art & Craft Coach, Yoga Teacher, Career Counselor PRT, Nurse & Other Post in KVS Nuapada, Odisha on Contract Basis. Candidates are invited by KVS Nuapada to attend walk-in-interview to be held on 25 Mar 2018 8:00 AM to 2:00 PM. KVS Surat Recruitment 2018 - Walk in for PGT, TGT, PRT, Coach & Other Post in KVS Surat in KVS Surat, Gujarat on Contract Basis. Candidates are invited by KVS Surat to attend walk-in-interview to be held on 24 Mar 2018 09:00 AM. KVS Tirupati Recruitment 2018 - Walk in for PGT, TGT, PRT & Other Post in KVS Tirupati in KVS Tirupati, Andhra Pradesh on Temporary Basis. Candidates are invited by KVS Tirupati to attend walk-in-interview to be held on 23 Mar 2018 and 25 Mar 2018 at 08:30 AM. KVS Guntur Recruitment 2018 - Walk in for PGT, TGT, PRT & Other Post in KVS Guntur, Andhra Pradesh on Contract Basis. Candidates are invited by KVS Guntur to attend walk-in-interview to be held on 24 Mar 2018 08:00 AM. KVS Bareilly Recruitment 2018 - Walk in for PGT, TGT, PRT, Coach & Other Post in KVS Bareilly, Bareilly, Uttar Pradesh on Contract Basis. Candidates are invited by KVS Bareilly to attend walk-in-interview to be held on 24 Mar 2018 08:00 AM.